Need privacy while controlling public access as you are working on construction sites across the UK? Heras fencing leaving you feeling too exposed? Then look no further, we can provide you with the perfect solution. At Lakeside hire our experts offer steel site hoarding hire whether you need temporary barriers in the short term or a strong durable screen for a longer period. Regardless of your timescales, hiring equipment is nearly always the most cost-effective option – and you needn’t worry about storage or transportation. All you need to do is pick up the phone and your equipment will be with you on site the following day – let us sort out all the finer details. 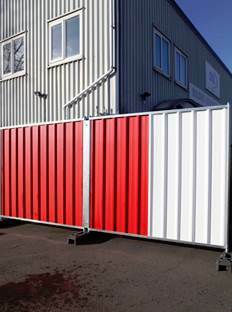 Our steel site hoarding is extra tough and because it is opaque you are guaranteed added security and privacy protecting your machinery and equipment from opportune theft. Tools and equipment are really expensive to buy nowadays, so it pays to do everything you can to look after them especially as statistics show that more than £1 million worth of kit was stolen from building sites across the UK in the last year. Installing steel site hoarding can also protect the company’s corporate images by giving contractors extra privacy and it is absolutely perfect for working in sensitive areas where public access is prohibited. If you are carrying out a very difficult task where all your concentration is essential it can be made still more difficult in front of an audience but hiring steel site hoarding offers you all the privacy you need. Because the hoarding is made of super-strong, tough steel, it is totally impenetrable and unclimbable so you can rest assured that you have done everything you can to deter intruders. It is so easy to put together, it can be assembled within a few minutes leaving you to get on with the work in hand. Whether you are working on a building site, or you need to control the crowds at a major event, hiring steel site hoarding could provide you with all the answers without damaging your pocket. Hiring steel site hoarding is dead easy. All you need is a mobile phone and a credit card. Just give us a call and we can help and advise you along with offering you all the solutions. Call us today and your steel hoarding will be with you, on site tomorrow – without fail.